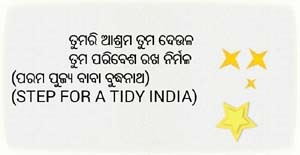 Garoi is the name of a remote village in the district of Jagatsinghpur in Odisha, an easterly state belonging to the Indian subcontinent. The village Garoi is situated on the banks of the River Gobari and River Devi. The Ashram at Garoi was established on the confluence of these two rivers by Baba Shri Buddhanāth Das, adjacent to his native village. 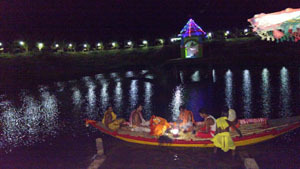 River Gobari is a local construct from the original name Gobardhana. The river which flows towards the north is known as Ganga. The Gobari river is merged with Devi river at Garoi, and is flowing towards north and is known as Gupta Gangā(hidden Ganga). 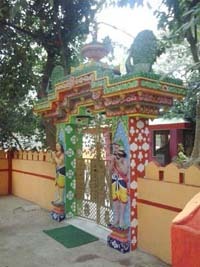 The place holds links to the four Yugas through various indications or Sutras (dots that hold keys to meanings and when connected together reveal the big picture), through existence of trees: Sweta Bata (Satya Yuga), Aswastha Brukhya (Tretaya Yuga), Siāli Brukhya Latā (Dwapara Yuga) and Neema Subhadrā Dāru (Kali Yuga). Shri Achyuta had hinted to Rām Das(in his literary work of Malikās) to identify his work place through these Chāri Sutras (four indications), near a river confluence where Gupta Gangā will be flowing in the neighnorhood. This is also a place where his (Baba Buddhanāth Das's) Six Gurus had Siddhi (enlightenment) under a Peepal tree whose offshoots exist to date. To view the Location of Garoi, please follow the Link in the Sub-Menu 'Garoi-Geographical location'. 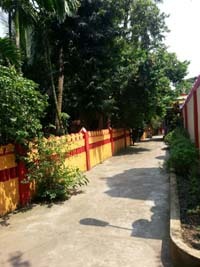 There are about 18 points of interest for cultural/heritage visitors at and around the location of the Ashram. Please see our 'Visitors Guide' using the link in the left vertical menu for the complete list. 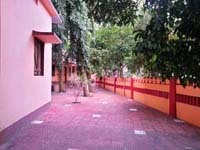 Shri Gobardhana Pitha Garoi Ashram: why this name? A long time ago, on this land and in the lap of the mother nature, a rishi named Gobardhana had his Ashram. 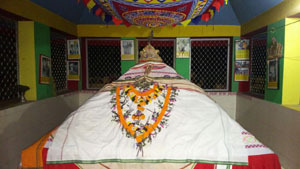 'Gobardhana Pitha Garoi Ashram' is named after this compassionate and Siddha Rishi. Rishi Gobardhana used to meditate on Shri Laxmi Svarupaa Maa Gautami. When he foresaw the atrocities of Kali Yuga, his heart was troubled and out of the desire for social welfare he offered heartfelt prayers to the Mother. Legend has is that, blessed by the wishes of the compassionate Mother, a stream of water had started to form from the Tarpana (oblation) water that later became River Gobari, from the name of Rishi Gobardhana. 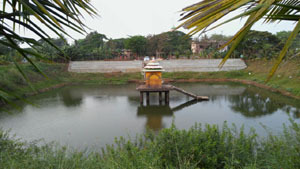 The river Gobari is also called as Gobardhana river. As per the ancient writings of the Seers, this Neem tree will provide wood in some Naba Kalebara, for making the Idol of Goddess Subhadra. This reference has been made in Bhāva Manjushā by Saint Arakhshita Das of Olasuni and TāmraPothi of Shri Achyutananda. While we do not know the exact year of the corresponding Naba Kalebara, partly because Shri Achyuta has not fully revealed this, the tree is protected and all rituals are observed here to keep the Tree suitable for making the idol of the Goddess, when the time comes. A mini video clip recorded in early 2004 and is made available from our Youtube channel. 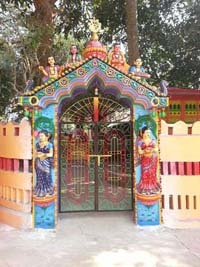 Also existing inside the Ashram premises is The Pahada Ashram (resting hut) of ShunyaDehi Mahapurusha Achyutananda Das. 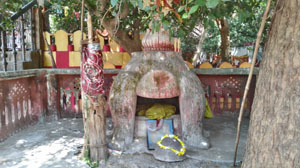 Legend has it that, Shri Achyuta, while travelling to places (Puri), stops by here to rest. Baba Buddhanath Das left his physical body on 2-Sep-2006. As per his wish and the place he had marked before leaving his body, a Samadhi has been built. Also the location where last Birthday in his physical body was observed, a Vigraha Mandira (temple with an idol) has been constructed (the two photos to your left). For more informaton on our beloved Baba, please click here. 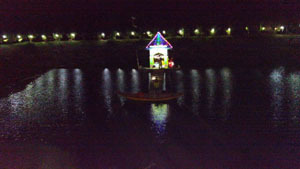 Chandan Pokhari is a sizeable Pond near Ashram where the annual Chandan Yatra (water-sport of the Lord) is celebrated. Chandan Yatra literally means Sandalwood paste festival and is a 21-day Summer Festival of the Lords that starts on Akshaya Trutiya (3rd day of the bright fort night in the month of Baisakha). This also marks the beginning of the construction of the 3 chariots of Jagannath, Balabhadra and Subhadra for Rath Jatra (car festival). The last day of this 21-day festival is celebrated in a grand scale and is culturally known as 'Chāpa' or 'Bhaunri (whirlpool) Yatra' in Odia language and has its origin from Lord Jagannath temple at Puri. A clip recorded during 2015 Chandan Yatra and is made available from our Youtube channel. 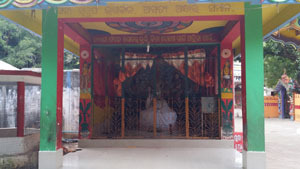 His Holiness Baba Buddhanath Das, under the instruction of his Guru, got constructed a Jagannāth temple at Garoi in 1993. 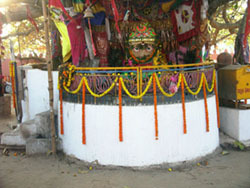 The place Garoi is considered by devotees as second Shri-Khsetra and Fifth Dhāma. "This Ashram is yours only, You maintain it and keep it neat. If you are hungry or thirsty here, look for what is there and eat or drink, whatever little or more is there. If you go hungry or thirsty, I remain hungry that day." He also added: "Sri Achyuta has repeatedly said: "Bhakta Ahārare Muhin Karai Ahāra - I get fed only when the devotees accept food". The Environment is yours too, thus keep it clean.